The registration fee is $350 per person if the Encounter Registration Form is received by May 31, 2019. Registration fee increases to $400.00 per person on June 1, 2019. We are unable to guarantee attendance after July 1, 2019. What is the date of the Encounter? Thursday, July 18 – Sunday July 21, 2019. Where is the Encounter being held? What is the Encounter registration fee? $350 per person if the Encounter Registration Form is received by May 31, 2019. Registration fee increases to $400.00 per person on June 1, 2019. Unable to guarantee attendance after July 1, 2019. The registration fee includes three nights lodging, dinner on Thursday evening, 3 meals on Friday and Saturday, and breakfast on Sunday morning. NOTE: Participants are responsible for their own lunch on Thursday. Lunch is not included in the registration fee. Can the Encounter registration fee be paid in payments? No, full payment per person must accompany the Encounter Registration Form. How do I register for the Encounter? 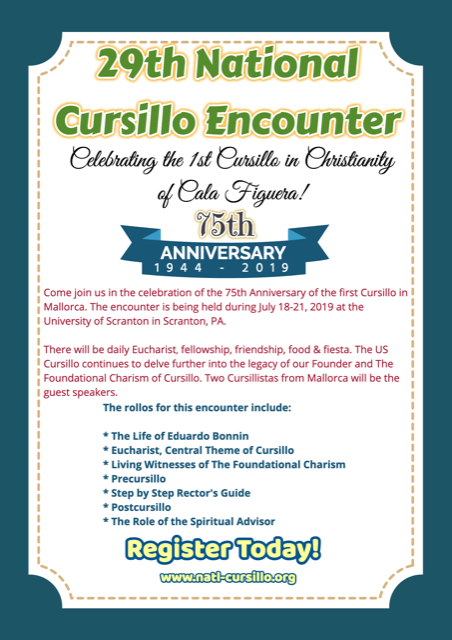 You may register on-line at www.natl-cursillo.org or download a registration form and mail form with full payment to the National Cursillo® Center, P.O. Box 799, Jarrell, TX 76537. You can also fax form to 512-746-2030, or e-mail form to admin@natl-cursillo.org . Use a separate Encounter Registration Form for each person. There is a $40.00 non-refundable fee for all cancellations up until June 15, 2018. No refunds after June 15, 2018 – No exceptions. How do I pay for Encounter registration fee? Payment can be made with major credit cards or personal check. Make checks payable to National Cursillo® Center and mail to National Cursillo® Center, P.O. Box 799, Jarrell, Texas 76537. Lay Directors can also redeem vouchers received from the $3/yr donation campaign to pay for the Encounter registration fee. Do I need to bring bed linens, etc? The University will provide bed linens, blanket, towels, wash cloth and pillow. Check-in is from 1:00p.m to 8:00p.m on Thursday July 18. What time does the Encounter begin? Dinner will be served from 5:15 p.m. – 7:15 p.m. Opening of the 29th National Cursillo Encounter will begin at 7:30 p.m. in the Byron Center. Cursillistas must check-out by 10:00 a.m. on Sunday, July 21, 2019. No exception. What airport will I be flying into? The University of Scranton is 15 minutes from Wilkes-Barre/Scranton International Airport (AVP). Complimentary transportation from/to Wilkes-Barre/Scranton International Airport will be provided on Thursday July 18 and Sunday July 21, 2019. Where can I get a campus map and driving directions to the University? What is the lodging capacity and set-up for the Encounter? 800 persons. Two persons per bedroom. Is there air conditioning on campus? Where can I send Palanca for the Encounter?